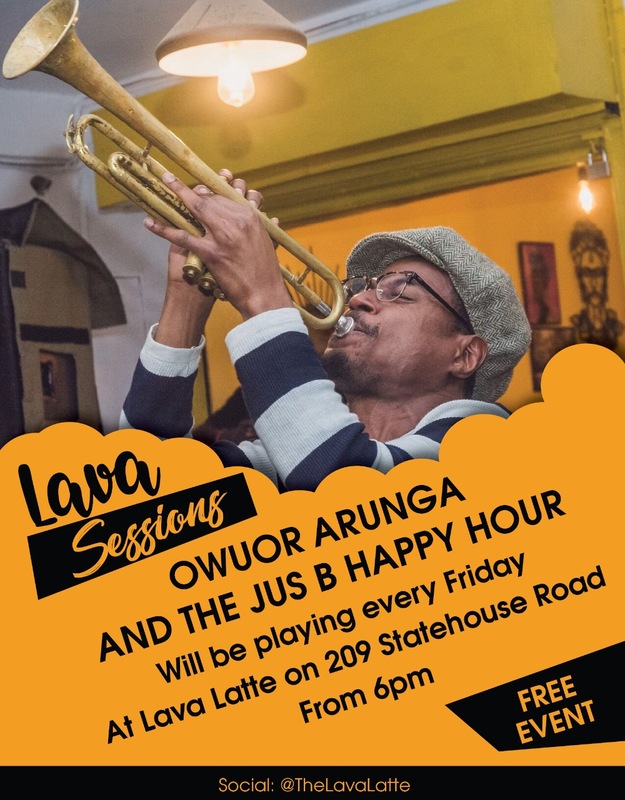 In 1977, an electrical fault in the telephone system at the original African Heritage House in Nairobi sparked an inferno that swept through the entire gallery, all its workshops and stores, the restaurant and the garden cafe. Only two art pieces of note were saved from the one-of-a-kind gallery operated by former Vice President Joseph Murumbi and American designer Alan Donovan. According to Donovan, the value of the art that was reduced to ashes is incalculable, but the damage it did to the preservation of African culture was even greater. Murumbi and Donovan met in 1971 at one of the latters exhibitions in Nairobi. The brief haggling over a fertility mask began a lifelong partnership to preserve Pan-African art. This eventually culminated in the building of the first Pan-African Gallery in Africa, the African Heritage House at the junction of Koinange Street and Kenyatta Avenue. The building was opened in January 1973 and had only been open for four years when a fire reduced its priceless collections made over decades to nothing but ashes. For its founders, the fire was a chance at rebirth and they moved the gallery to the nearby Hughes Building owned by Edith Hughes on Kenyatta Avenue as the burnt house was rebuilt. Once complete the African Heritage house moved back to its old location. It stayed there for another two decades until 1997 when it was demolished to set up what is today the iconic blue I & M building. 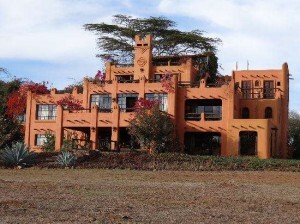 Donovan moved it to Mlolongo where it has been since but the new one was marked for demolition until it was gazetted as a national monument in early 2015. Another fire that burnt priceless documents was the City Hall fire disaster of 2004 that cleared the entire third floor. The damage was estimated at KShs. 70 million. 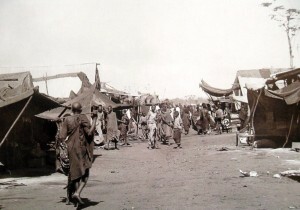 In 1902, what is today Kenyas capital city had only one main street, Indian Bazaar or Biashara Street, with medieval structures serving the growing population. With no sanitation services, the rat population thrived. People suddenly started dying, and showing symptoms the colonial officers had read in horror books. By the time it was diagnosed as the dreaded Black Death that had massacred a large part of Europes population centuries before, the plague had claimed 20 lives on the street. The government machinery at the time rested upon the shoulders of one man, the Medical Officer of Health, Dr. Alfred Spurrier. Presented with an epidemic likely to decimate the entire population of the nascent capital city, Spurrier referred to the solutions his ancestors in Europe had used to curb the plague. He ordered the entire street; busy and important to the young protectorate, burnt down to control the plague. The knee-jerk reaction worked but it dealt an immeasurable blow to the young economy. Only the people were evacuated from the street before it was set ablaze. In a single day, the first trade hub in what would become the capital city was gutted down. The fire burnt down the practice of the good doctor who made the diagnosis. A fire disaster that came close to this was the burning down of the entire Free Market at Uhuru Park in 2001. There were also no casualties but there was a massive loss of property. The cause of this fire is still unknown. Faza town after the 2009 fire. The historic islands that make up the Lamu Archipelago have seen more than their fair share of fire disasters. Many of them happened in the centuries before Kenya took over administration of the coastline at independence in the 1960s, and even before the islands were placed under British rule in the 19th century. In 1586, for example, the Portuguese set the Faza settlement ablaze as punishment for collaborating with the Turkish Amir Ali Bey. They also massacred most of the population and beheaded the king, taking his head to Goa where it was preserved in a barrel of salt. The worst fire disasters in recent history have cost less in lives but have left more people homeless as the population has grown. In March 1982, a fire destroyed down most of the town known as Langoni in Lamu. It left 4, 000 people homeless after destroying hundreds of homes and businesses and would have spread further if the wind direction had not changed. The fire eerily matched a similar one that had razed down the previous generation of buildings in the same area in 1962. There were no reports of direct loss of life from these two fires. 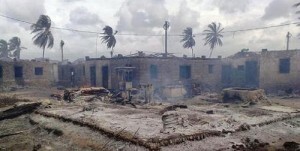 In 1990, however, a devastating fire rode the famous strong winds of Lamu and left 20 people dead and thousands homeless. It is unclear whether this is the same fire often reported as the Faza fire of 1990 but there is some likelihood they were two different fires in the same year. Faza, the aforementioned town the Portuguese decimated was the scene of the latest major fire disaster. The fire occurred on 5 September 2009 in Faza, destroying 430 homes. According to the local administration, the fire started in a house where an old woman had left a jiko unattended and her two sick sons in the house. For a town that had survived numerous fire disasters before, it was a small oversight that would lead to 80 percent of the entire settlement being reduced to smouldering ashes, with 2,500 people not knowing where they would spend the night. As of 2014, there is still no fire station in Lamu and its neighbouring islands despite the risk of a fire disaster being more likely than that of a destructive tsunami. Firefighters battle to control the Nakumatt Downtown Fire. 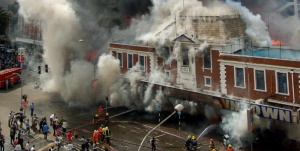 At 3.45 PM on Wednesday 28 January 2009, an uncovered generator started a spark that would burn for days and cost tens of lives and hundreds of millions worth of property. The fire started on the ground floor beneath the only stairway, trapping all the people on the upper floor to the heat and imminent death. Even worse, there were reports that in the hours before the fire became unbearable, the guards and the management locked the main doors of the Nakumatt Downtown Supermarket on the junction of Kenyatta Avenue and Kimathi Street to prevent looting. Later, however, it was clear that all the dead had been on the upper floor and had died because they could not access the ground floor. In the panic, a few brave people leaped from the upper floor’s windows to the street below. One man died from injuries he sustained during the fall but a few sustained injuries but lived to tell the story. By the time the last smouldering ashes were extinguished, at least 29 people were confirmed dead with 47 missing, most likely charred beyond recognition, their remains undistinguishable from the supermarkets stock and equipment. 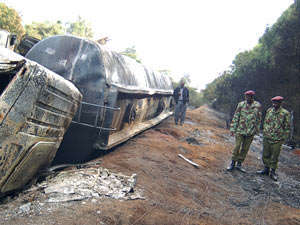 Among those dead were the young actress Angel Wainaina, and the CEO of a leading Kenyan local football team, Tusker FC. The irony of the fire was that the supermarket store was located just a hundred meters away from Nairobis only public fire station which is one of the oldest structures in the city. When the fire-fighters finally came, the blaze was so hot that it had to be fought over 24 hours within which time it had spread to neighbouring buildings. Four months after the fire, National Museums of Kenya announced that any new structures on the site would have to bear similar features to the previous Woolworths building which was one-floor red-brick building. The building has never been restored and the area is now used as a car park, cordoned off by huge billboards that hide what was once Nairobi’s most convenient Nakumatt store. The remains of the death-ferrying oil tanker. There are numerous images of the actual gore and dead bodies online. Only three days after the Nakumatt fire, an oil truck overturned in a small town called Sanchangwan in Molo in the Rift Valley. What began as an ordinary accident would eventually claim more lives than the Nakumatt Fire. Within the next several hours, people travelled from the town and other neighbouring towns to siphon off some of the 47, 000liters of fuel the fuel tanker was ferrying from Mombasa. Hundreds more stood further away, about 50 meters, aware of the danger the leaking fuel caused but not of how bad the looming disaster would be. How these fires begin is often a matter of contention although the most common reasons are tossed cigarettes, static electricity or even a spark from the overturned vehicles battery. At 7.30 PM, all hell broke loose with an explosion whose flames not only trapped the dare devils busy siphoning off fuel but some of the people who thought they were standing a safe distance away from the disaster. The fire spread along the fuel leak and with some of its victims who ran for dear life hoping to find a fuel-free place to roll down and put off the fire. Sadly, the nearby forest had caught fire too, turning the dark night into a horrific show of the destructive power of fire. Nearby cars and motorcycles exploded too, creating a cacophony of death and pain that would last the entire night. The first fire fighting teams arrived an hour into the disaster. Even then, the fire was too hot to do much, leaving most of the work for the rest of the night and the morning. By then, at least 113 people were nothing more than charred ashes, with hundreds more suffering from first and second degree burns. Six months later, a similar disaster occurred in Kapokyek village near Kericho, killing at least 45 people. The first such disaster happened in Banana Hill, Kiambu, in the early 2000s and cost tens of lives. The interestingly-named Sinai slum burns. Unlike the people of Sanchangwan and Kapokyek who travelled to their fiery deaths, the people of Sinai had been living next to an oil pipeline for decades. The risk had been known many years before that fateful and chilly September morning but only feeble attempts had made to relocate the squatters. In the morning of 12 September 2011, the residents of Mukuru-Sinai woke up to what many thought was hydrocarbon manna. Sometime in the night, a failed gasket at a nearby fuel tank owned by the Kenya Pipeline Company had given in, releasing over 19 million cubic meters of fuel into an open storm drain that flowed right through Sinai. It was not the first time such a spillage had occurred and on cue, hundreds of residents rushed to scoop the fuel. What was different was that this time the fuel was petrol and not the diesel that leaked during previous times. No one knows what exactly started the fire, and no one is even sure it had just one cause. What followed though was a scene straight from the seventh hell, an explosion of death so wild and fiery that it would dwarf all previous petroleum disasters in the country. The fire spread so fast and so wide that its actual cost in human lives is still just a rough estimate. 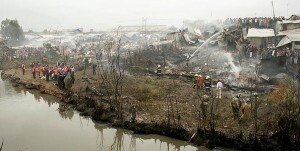 The fire spread across the slum, razing down the shanties built of carbon box material and other combustible materials. Even worse, the early birds had kept their flammable loot in their homes, worsening the already macabre situation. Since it was a settlement, an illegal one nonetheless, the population was undocumented and many people were still at home or conducting their business when the fire chased them down and burnt them to nothing. When the sea of flames finally died out, it was clear that its damage was unprecedented. The death toll hit 100 people by the 13th September, and is now estimated at anywhere between 100-300 people while 116 people were hospitalised. The exact number will never be known because a good number were undocumented and some were lost in the nearby River Ngong’. The murky waters of the river, coupled with the fact that all the fuel that wasnt being scooped into jerricans was flowing into the river made it a waiting hell for the victims who plunged into the river hoping to put off the fires that were killing them and at least cool down their bodies. There is an ongoing class action suit against the Kenya Pipeline Company for gross negligence and corporate manslaughter. The macabre site in the dorm the morning after an arsonist set a dormitory ablaze at Kyanguli Secondary. At approximately 1.41am on March 26th, 2001, an arsonist poured petrol in the middle of a dorm at Kyanguli Mixed Secondary School and struck a match. There were two doors on either end of the dorm but one was bolted shut?because someone had lost the keys and no one ever bothered to break the lock. The windows were barricaded with metal grills, leaving only a single exit point as the only salvation for the 146 boys sleeping in the dormitory at the time. For the half closest to that door, a quick means of escape was definite. For the others on the other side of the door, that fateful night would be their last. By daybreak that day 68 young boys aged between 14 and 20 had been reduced to nothing but smouldering ashes meshed together with what remained of their mattresses, beddings, and belongings. No fire service responded in the hours the inferno was bringing down the building, eventually making the tin roof collapse on the helpless students. The original report to the police in the night was that it was just student unrest and did not explicitly mention the raging fire until it was too late for half the boys in the dorm. In the days preceding the disaster, there had been tension in the school over a myriad of things, chief among them being the cancellation of the results of 100 students who had done their KCSE examination the next year. The bone of contention was whether they should pay fees to retake the year and resit the examination. As the tensions simmered among the students, reports of the strong pungent smell of petroleum spread. The school administration panicked and set out to find the flammable liquid but they only searched the school grounds and not the dormitories where it was most likely hidden. Two 16-year olds, Felix Mambo and David Onyango, were eventually charged with the senseless act of arson that resulted in mass murder. The headmaster and his deputy were charged with failing to prevent a felony. As is common in such disasters, most of the dead were buried in a mass grave, their young embers extinguished by a single act of madness. Three years before the Kyanguli fire disaster, another fire had gutted down a dorm in near-similar circumstances at the Bombolulu Girls Secondary School. 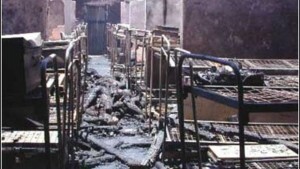 The fire had killed 25 girls, also in the middle of the night.